Are Dolphins set at quarterback for long-term? Ryan Tannehill has been the Miami Dolphins starting quarterback for two seasons. The NFL is known as a quarterback’s league. Translation: A team needs a talented, steady QB to perennially entertain postseason thoughts and Super Bowl dreams. The Miami Dolphins have been without a "franchise quarterback" since Hall of Famer Dan Marino retired after the 1999 season. Which brings us to Ryan Tannehill, who just completed his second year in the NFL and second as Miami’s starting QB. At best, the Dolphins have a young starting quarterback with enough talent to develop into the desired performer in the next few seasons. At worst, Tannehill will prove not to be the long-term answer forcing the Dolphins to find another option. Miami was 20th in passing in 2013. That ranking was low when one looks at the team’s talented receiving corps led by Mike Wallace and Brian Hartline. But then again, the ranking was understandable considering offensive line issues that resulted in a league-high 58 sacks and contributed to a poor rushing attack. Tannehill again will be the starter as coach Joe Philbin returns for his third season. Mike Sherman, Tannehill’s head coach at Texas A&M, was fired after two years as Miami’s offensive coordinator. Another playoff-less season very well could end Philbin’s tenure and Tannehill’s lock on the QB job. After an almost three-week long search, the Miami Dolphins have finally found their new general manager. 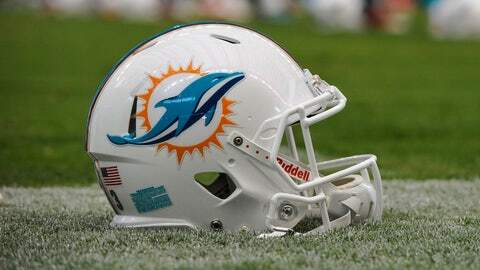 The Dolphins announced the hiring of Dennis Hickey late Sunday morning. Ryan Tannehill — Personable with a strong work ethic, he has exhibited leadership qualities on and off the field. The former wide receiver showed some athleticism this past season, especially during the second half when he sometimes rolled out in an attempt to avoid opposing pass rushes. However, Tannehill struggled to consistently deliver the long ball, especially when attempting to hook up with newcomer Wallace. He threw for 24 TDs in ’13 but also 17 INTs, a number that needs to be lowered. It’ll be up to new offensive coordinator Bill Lazor, who as the Eagles quarterback coach helped groom Philadelphia QB Nick Foles, to help Tannehill get to the next level. Matt Moore — The man who started 12 games for Miami in 2011 completed his second year as the backup. 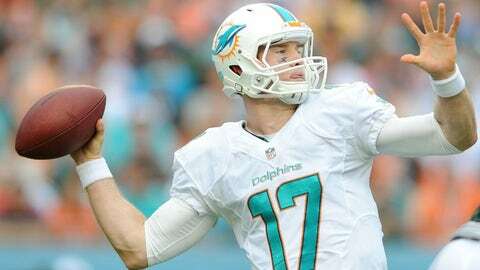 Tannehill’s durability limited Moore to one game and six throws this past season. The seven-year veteran rates as a competent No. 2 who understands and accepts his role. Pat Devlin — The Delware product hasn’t played during his first three years with Miami. However, he has been the recipient of Philbin compliments during the past two preseasons. Still, he’ll need to show growth in training camp or the team might feel the urge to go with another young QB to develop. With bigger needs elsewhere — primarily on the offensive line and at running back — it’s difficult to imagine the Dolphins pursuing a free-agent QB as long as Tannehill appears on the upswing. Miami undoubtedly will use its high draft picks to try and address problem areas (offensive line, running back) or areas than could be upgraded from last year (e.g. linebacker). There’s always the chance of a mid-to-late-round pick being used on a quarterback who the team believes is worth investigating. Some Dolphins fans yearn for the next Marino. Others hope Miami finds the next Peyton Manning, or the next Tom Brady, or the next Aaron Rodgers or the next Drew Brees. (Then again, Nick Saban’s Dolphins could have had Drew Brees.) Such dreams while not impossible, are unlikely. Fact is, Miami has a young quarterback in Ryan Tannehill who might be able to develop into a top-level passer if given protection and a decent running game.